This is going in the mail tomorrow! What a productive day I've had! Makes all the difference when you get up and moving instead of sleeping in!! I have too many things to do this week to sleep very much! So far, so good. Check one off the list, swap completed!! Card base is the new In-Color, Melon Mambo, Textured Cardstock. SU! now has In-Color Textured CS in 8-1/2 x 11-YEAH!! That is my favorite, and the easiest size to use when making cards! Background layer is Basic Gray. The flowers are from the new Greenhouse Garden set. Once again, you will need the stamp-a-ma-jig to get the desired look! Remember to just use Vellum Cardstock for your image sheet and save it with the set. The flowers are stamped in Melon Mambo & Crushed Curry (another new In-Color) on Shimmery White CS. I stamped the solid image off once on scratch paper, then came back with the detail image full strength. Stems are Mellow Moss also stamped off once for a subtle look. 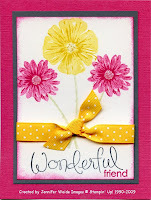 The "Wonderful friend" is from the Wonderful Favorites set, Wonderful is in Basic Gray, friend in Melon Mambo. I sponged lightly with Melon Mambo around the edge of the Shimmery White & added a ribbon of the Crushed Curry Polka-Dot grosgrain. Lastly, I added some Crystal Effects to the center of each flower & topped it with Dazzling Diamonds glitter. Back to work! I'm staying very busy watering the yard and flowers-it's VERY hot & dry here. But, I almost have the Open House projects all worked up! Don't miss it-details here! !